The Bungalow has 5 large double guest rooms. 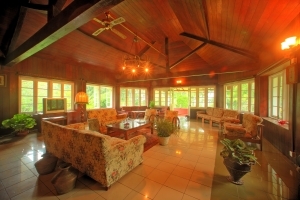 The Bungalow has 2 suites with high ceilings and British colonial features. The suites have a double bed and an attached bathroom. Each suite room can accommodate up to 2 adults and 2 kids or 3 adults purely due to their size and spaciousness. The 3 guestrooms are overlooking the pool. 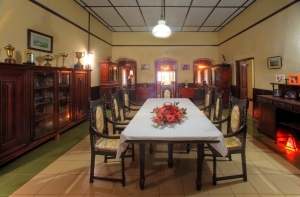 They are comfortably furnished with twin or double beds and have ensuite bathrooms. A long verandah outside the guestrooms with lounge chairs is the perfect setting to read your favourite book or just relax by the pool. All bathrooms have hot water showers, natural daylight, and ample space. Inside The Bungalow, the living room is a haven with cosy sofas and antique furnishings from Sri Lanka and Germany. Likes of a deer antler chandelier and brass artifacts are not out of place in this tasteful space. With its grand solid oak 8 seater table and chairs, the dining hall is where our guests enjoy the scrumptious home cooked Eastern and Western cuisine.